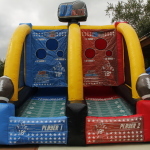 Quarterback Blitz is great for Festivals, events and birthday parties! Our QB Blitz™ features fantastic 1 on 1 competition for all players! Each of the target holes in the backdrop are different sizes and worth different amounts of yardage. 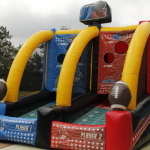 Each player moves their team down the field throwing their footballs through the holes for the winning touchdown! This fun game is available by itself for $125 or can be rented as an add-on to another rental for $75.